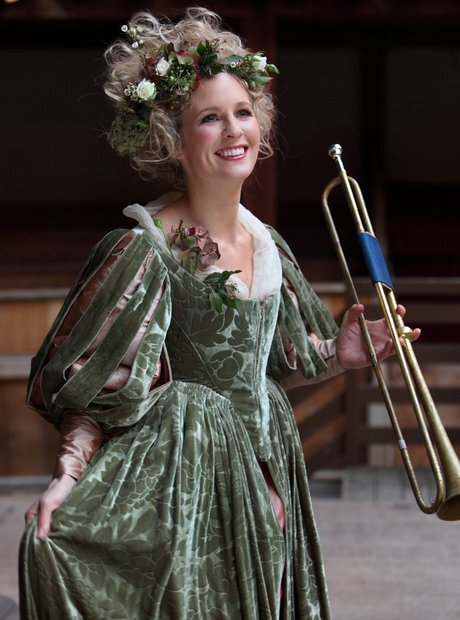 The talented trumpeter is performing in Gabriel at Shakespeare's Globe Theatre, exploring the history of the valveless trumpet in the context of late 17th century London. Take a look inside this iconic building, and see the trumpet through Alison's eyes. In full period costume, with a natural valveless trumpet, Alison Balsom is making waves with her latest musical-theatrical production, working with the award-winning writer Samuel Adamson. The new production, Gabriel, explores the notion that the natural, valveless trumpet was the supreme musical instrument of the Restoration - making the most powerful sound possible at the time! A modern trumpet player uses a combination of mouth shape and valves to create different notes on the instrument, but the valveless trumpet does just what it says on the tin - because there are no valves to change the notes, it's notoriously difficult to play. As well as seeing Alison Balsom in full period dress, the plot of the play includes kings, queens, trumpet makers, and every day folk from 17th century London. Expect some fabulous costumes! Alison performs on stage at the Globe theatre with another period instrument: a theorbo. It's a plucked string instrument in the lute family. Alison chose the Globe because of its history and brilliant acoustic. The building is made of a lot of wood, creating the perfect environment for a valveless trumpet performance. Classic FM's Lucy Coward went down to the Globe Theatre to speak to Alison about the project, ahead of a special programme on Monday 27 May. While there are plenty of seats for the audience, should they wish to sit down, one of the features of the Globe Theatre is being one of the 'groundlings'. In the 17th century, the poorest theatre-goers payed one penny to stand up in the pit and watch the play. We don't think it looks like a 'garden' at all! A beautiful flower garland, complemented by the star of the show, Alison Balsom - and the natural trumpet. "If you think about it, at the time, the trumpet was an incredibly powerful piece of equipment," Alison explained to Lucy Coward. "There was nothing that could create a sound that powerful and that terrifying." Giving us a view of the historic building, Alison takes to the stage to play pieces by Handel and Purcell. Take a look at the wonderfully ornate ceiling. Alison explained the motivation behind the project: "It started with a recording I made of music by Purcell and Handel, and it was really important to me that I played on this trumpet, which is a natural trumpet, very different from the modern piccolo trumpet." "I've had a lot of meetings with the playwright, Samuel Adamson, who's an incredibly talented and experienced playwright, and talked so much about the essence of what I feel the trumpet can do, and what the music of the time can convey." When Alison was planning the project and looking for a venue, Shakespeare's Globe came to mind immediately: "I think the trumpet can work in this building because it's all wood, and the trumpet sounds so great in a wooden structure."